On 9 December, the master made the decision to conduct an abandon ship drill before the vessel was due to depart for Geelong. The company technical manager had requested the lifeboat release equipment be tested on-load. The drill commenced at about 1540 and the starboard lifeboat was prepared for lowering to the water. Prior to the crew boarding, the master ordered the starboard lifeboat to be lowered about three metres from the davit head and then to be hoisted back to the stowed position as a safety precaution. This operation was performed without any apparent problem and the master noted, at that time, that indicators on each on-load release hook appeared to be in the fully reset position. Six members of the crew boarded the lifeboat under the command of the mate. At approximately 1548 the mate reported that the crew inside the lifeboat were seated and had fastened their safety belts. Lowering of the boat then commenced with one of the crew operating the davit winch brake from the deck.When the boat had been lowered approximately two metres from the davit head, the after on-load release hook suddenly opened, releasing the after fall. 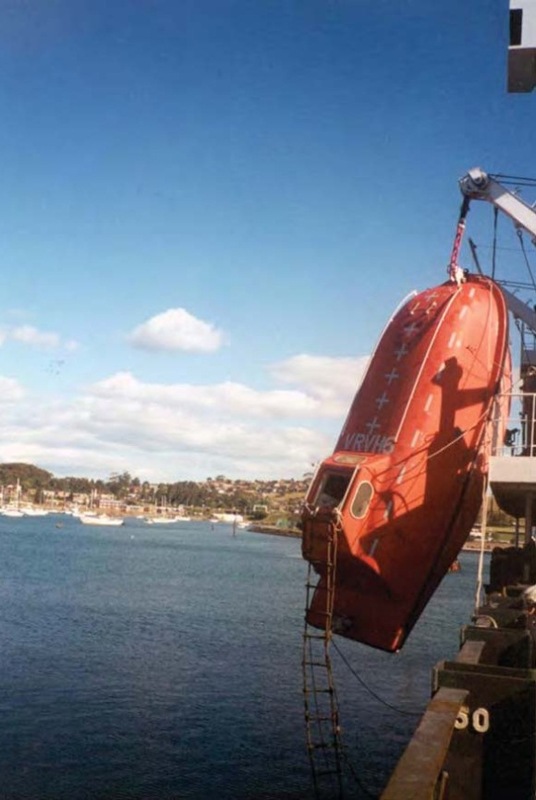 The lifeboat’s stern fell to leave the boat suspended vertically by the remaining, forward, fall its stern swinging approximately five metres above the water. The forward fall and hook continued to hold the weight of the lifeboat although the heavy steel fall suspension ring had been bent during the boat’s fall. The crew inside the boat were shaken by the incident but remained secured in their seats inside the now vertical lifeboat. The second mate had sustained a small cut over his left eye. After checking on the condition of the crew inside the boat, the master contacted Devonport harbour authority to inform them of the situation. He was told that the pilot boat was busy and would take 20 minutes, or so, to reach the ship. The master decided not to wait for the pilot boat and instructed the crew to rig a ladder from the handrails adjacent to the lifeboat’s upper hatch.When the ladder had been satisfactorily rigged, the crew exited the vertically suspended lifeboat, one at a time, until they were all safely back on the deck of the ship. During this time a marine surveyor from the Australian Maritime Safety Authority happened to be passing the ship on his way home from work. He saw the vertical lifeboat and decided to investigate, arriving on board while the crew were still climbing out of the lifeboat. After the crew had disembarked, a chain block was rigged to raise the stern of the lifeboat so that it could be lowered to the water. By about 1800, the lifeboat was in the water and the crew boarded the boat again to inspect it and determine the cause of the incident. After several attempts to reset it, the crew found that the after on-load release hook was not resetting fully. Close inspection of the on-load release system revealed that the cable operating the after hook was not properly secured by the saddle clamp under the operating unit. Each time the actuating handle was operated, lost motion was induced by the cable sliding through the clamp. The second engineer then repaired the clamp by placing some brass shim material, as packing, between the saddle of the clamp and the metal ferrule on the operating cable to increase the clamping pressure. The system was then successfully reset and operated again several more times. The davit falls were then reattached and the security of the hooks was tested by raising and lowering the lifeboat several times. By 1930 the starboard lifeboat had been raised to the davit head and stowed. There was some difficulty fitting the after harbour pin as the forward fall suspension ring had been distorted when the lifeboat’s stern fell and the weight of the boat was suddenly transferred to the forward fall. 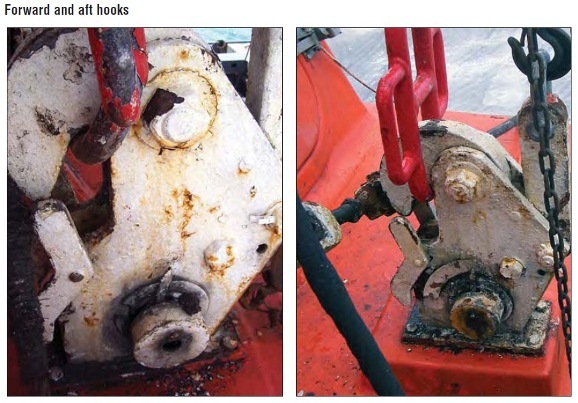 The damage to the suspension ring meant that the forward end of the boat was slightly higher than the after end when the boat was at the top of the davit. Ma Cho finally departed Devonport and sailed for Geelong on the morning of 10 December. The AMSA surveyor had inspected both of the ship’s lifeboats prior to departure and issued a deficiency notice stipulating that the classification society was to inspect the starboard lifeboat while the ship was in Geelong. The cable clamp securing the aft hook’s operating cable adjacent to the operating mechanism had been modified at some time in the past and was allowing the cable’s outer sheath to move, resulting in lost motion within the cable. The after hook had not been fully reset, as a result of the lost motion in its operating cable, when the previous lifeboat drill was conducted on 2 November 2002. 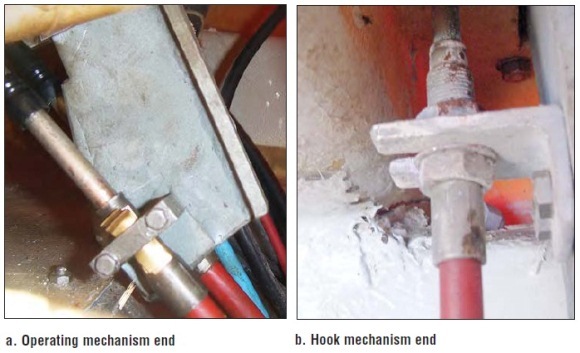 The relative movement between the cable clamp and the aft hook operating cable also meant that the operating mechanism could not oppose the additional tripping force caused by the aft hook’s partially reset condition. The ship’s safety management system was deficient with respect to the operating and maintenance instructions and crew training on the on-load release system. The maintenance of the on-load release system was poor. The vessel’s crew were insufficiently trained in the operation of the on-load release system. The design of the hook locking mechanism is potentially unsafe given its susceptibility to tripping under load. It is recommended that Qingdao Beihai Shipyard review the design of their BG-3 onload release system in respect of the hook locking mechanism in light of the incident aboard Ma Cho. 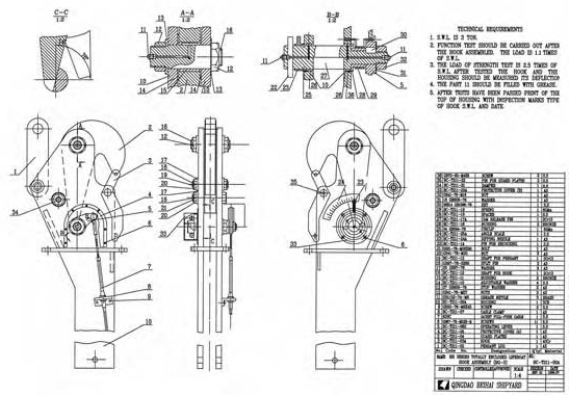 It is recommended that classification societies issuing approvals for on-load release systems review the in-service safety of designs with hook locking mechanisms using the same principle as that used on Ma Cho’s lifeboats. It is recommended that all ISM Code accreditation authorities ensure that the safety management systems on all vessels fitted with on-load release equipment provide adequate safeguards to mitigate the significant risks of operating and maintaining these systems.